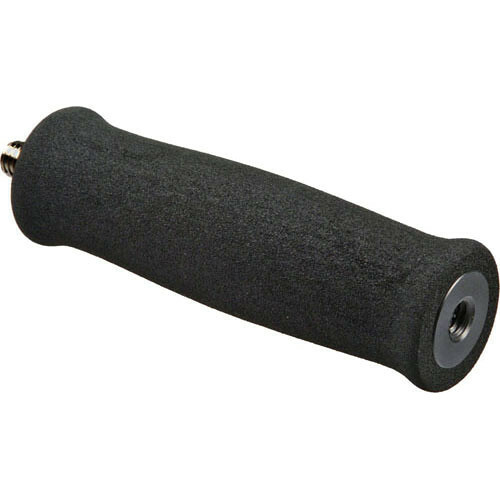 The Auray Universal Microphone Pistol Grip is a handheld grip that features an ergonomic cushioned handle. This grip is great in "run & gun" situations in which a boom pole would be cumbersome, and in video scenarios in which the cameraman is also responsible for audio recording. The grip can be held with one hand, as opposed to a boom pole which requires two. It also provides the option of being able to record audio from a different direction than the camera is pointing, an advantage over camera mounting the mic. Furthermore, having the mic mounted off the camera prevents it from picking up motor noise from the lens focusing. In addition, the grip features standard 3/8" threads on both ends. This allows you to attach your shotgun mic (with shockmount) to one end of the grip and mount the other end to a boom pole. This gives you the flexibility of being able to quickly detach the pistol grip and the attached shotgun mic from the boom, an option that can come in handy for entering areas that are too small for a boom pole. Box Dimensions (LxWxH) 6.1 x 2.8 x 1.7"
Universal Microphone Pistol Grip is rated 4.6 out of 5 by 33. Rated 5 out of 5 by Brian J from Well designed I actually use this as a handle for an off camera flash which allows an assistant to hold and follow a moving object that I'm shooting. The male and female threads on either end are a good design, allowing more rigging options. Rated 5 out of 5 by that video guy from The Great Isolator This little guy is a great way to use your shotgun as a mini-boom. It isolates the microphone and shock mount from hand rubbing noise and is easy on the wrist. All in all, a great buy. Rated 5 out of 5 by teepee from Versatile Great hand grip, but beauty of this is that it attaches to end of boompole. This allows for a bit more reach, and flexibility in quickly going to hand-held situation. Rated 4 out of 5 by chandler from Not professional, but reliable It's got a lot of conveniences. I like that I can attach it to the boom and to my shock mount. I also like the fact that I can attach to it, any shockmount I want. It's not as professional looking as something from rode, but it get's the job done. Which brings out my only downside, I can't really use it in conjunction with the rode blimp, but other than that, I love it. It really helps when I can't fit a boom pole anywhere or for when I'm recording sound effects. Rated 5 out of 5 by Marc from Solid grip Good grip for shotgun mics, solid and comfortable. Pretty basic product but it's all you need. Rated 5 out of 5 by Mike in NYC from Very comfortable and well-made grip. I have been using this grip to conduct interviews with my Shure shotgun mic and it's been great so far. The fabric is very comfortable and does not feel clammy. It is very sturdy and attractive and adds a little flare. So far so good and I believe it is an excellent addition to my video production kit. Rated 5 out of 5 by Glen C. from Solid hand grip A good basic grip for a handheld microphone. I'm using it with a Pearstone shock mount for a Sennheiser MKE 600. It's a little expensive for what it is but it's solidly built. In addition to the shock mount, I'm using it as an extender on my desktop microphone stand to give it extended reach.